The top closed gentian at Sandra Pond. Bottom, a bumblebee dives deeper into the bud-like flower. The fresh blossom in the foreground is white around the entrance, tipping bees off to the nectar inside. A late-September walk along one of Westborough's many shorelines might reveal a surprising treat: closed gentian with its deep blue flowers that never open. This late in the year, most of us don't expect to see a wildflower just coming into full bloom, but our native closed gentian (Gentiana clausa) does exactly that. The purple-blue flowers look like large buds or small tulips that haven't opened. The plant is also sometimes called bottle gentian because of the shape of the blossoms. People who fish from shore are especially likely to happen upon closed gentian. The partly shaded shores of Sandra Pond, Mill Pond, and Lake Chauncy are good places to find it. It also sometimes grows at the edges of wet meadows. Look down as you walk, because the plants lie low and you may suddenly spot the blossoms at your feet. Not surprisingly, closed gentian presents a challenge to bees. They have to work hard to muscle their way into the never-opening flowers. Their reward is nectar at a time of year when there's less and less to be had. Older blossoms, with their nectar supply exhausted, turn blue-purple at the opening. Bees pass right by these flowers that have no marked entrance. 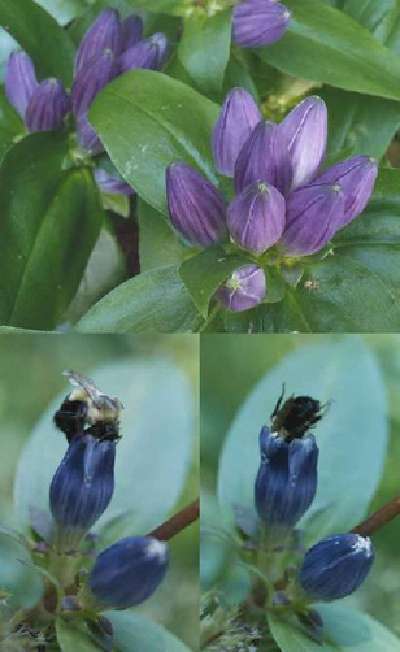 The efficiency of the color-coding scheme helps the bees to get nectar and the closed gentians to get pollinated. Similar color-coding exists in other flowers as well. Notice, for example, how the daisy-like flowers on a wild aster may start out with bright yellow centers. As time passes, the centers turn brownish-purple. A single plant may have flowers with differently colored centers at the same time. If you are fortunate enough to come upon a small colony of closed gentian, don't pick the flowers. This plant is less common than it used to be. Instead, remember where you found it. Closed gentian is a perennial, so you'll be able to enjoy it again in the same spot next fall. Closed gentian is relatively easy to grow from seed if you have a place in your garden that stays moist. Be sure to get seeds from a reputable source, such as the New England Wild Flower Society in Framingham, which has an extensive catalogue of wildflower seeds.